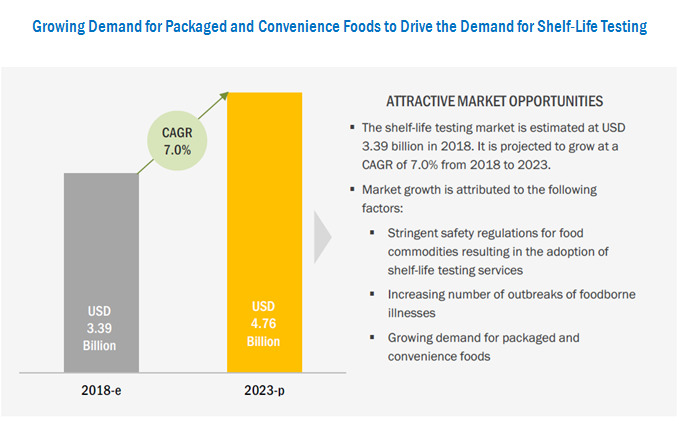 [138 Pages Report] The shelf-life testing market was valued at USD 3.19 billion in 2017; it is projected to reach USD 4.76 billion by 2023, at a CAGR of 7.0% during the forecast period. Stringent safety regulations for food products, increase in the outbreak of foodborne illnesses, and growth in demand for packaged and convenience food are factors driving this market. The key players were identified through secondary sources such as the Food and Agriculture Organization (FAO), the US Department of Agriculture (USDA), International Monetary Fund (IMF), World Bank, and Organisation for Economic Co-operation and Development (OECD), while their market shares in the respective regions were determined through both, primary and secondary research processes. 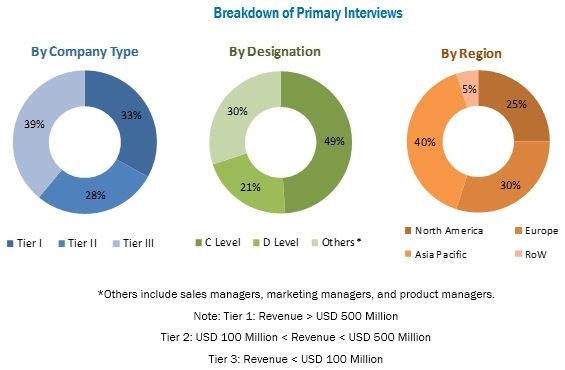 The research methodology included the study of annual and financial reports of top market players, as well as interviews with industry experts (such as CEOs, VPs, directors, and marketing executives) for key insights (both quantitative and qualitative) for the shelf-life testing market. The various contributors involved in the value chain of the shelf-life testing market include raw material suppliers, R&D institutes, shelf-life testing service providers [such as SGS (Switzerland), Bureau Veritas (France), Intertek (UK), Eurofins (Luxembourg), and ALS Limited (Australia)], shelf-life testing equipment manufacturing companies, and government bodies & regulatory associations [such as the US Department of Agriculture (USDA), the Food and Drug Administration (FDA), and the European Food Safety Authority (EFSA)]. The rise in the level of intricacies and an increase in the number of supply chain participants have made it difficult for manufacturers to be able to uniformly adopt hygienic and sanitized manufacturing practices. Such factors have further led to an increase in the number of food contamination incidences, thereby compelling various governments across the globe to implement and further develop stringent food safety regulations. This has fueled the growth of the testing, inspection, and certification market, with different regulatory bodies such as the United States Department of Agriculture (USDA) and European Food Safety Authority (EFSA) introducing guidelines for testing, inspection, and sampling services for the safety and quality assurance of food products. Similar guidelines are adopted by other countries, worldwide, with variations and exceptions in laws. Incidences of foodborne illnesses occur primarily due to the consumption of food contaminated by pathogens or the growth of yeasts and molds that may or may not be pathogenic. This could also happen when a food commodity exceeds its date of expiry, whereby it ceases to be microbiologically safe for consumption. According to a WHO estimate released in 2015, around 600 million people in the world fall ill after eating contaminated food, of which 420,000 die every year. According to a Centers for Disease Control and Prevention (CDC) estimate released in 2012, each year nearly 48 million people get sick, 128,000 get hospitalized, and 3,000 die, due to foodborne illnesses, in the US. According to the Food Standards Agency (FSA), every year around 1 million people are affected by foodborne illness, and nearly 20,000 people receive medical treatment for foodborne illnesses in the UK. Furthermore, about 500 death cases are reported as a result of food poisoning, costing approximately USD 2.0 billion, in the country. The food industry in developing countries remains highly fragmented and is predominated by small and unorganized players, who may have not necessarily adopted proper food testing and shelf-life testing practices, leading to a greater risk of their contamination. Testing of food & beverage products, such as packaged foods, dairy products, beverages, and meat products, among other samples require proper enforcement measures, coordination between market stakeholders and supporting infrastructure. However, many countries that are classified in the cluster of developing economies lack these factors acting as a restraint for the shelf-life testing industry. This research report categorizes the shelf-life testing market based on parameter, food tested, method, technology, and region. 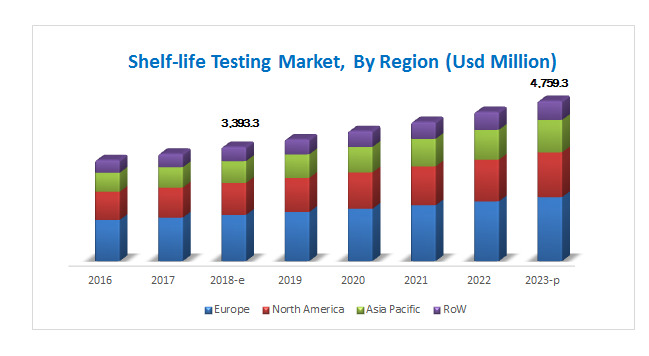 The shelf-life testing market is estimated to be valued at USD 3.39 billion in 2018 and is projected to reach USD 4.76 billion by 2024, at a CAGR of 7.0% during the forecast period. The market is driven by stringent safety regulations for food products, increase in the outbreak of foodborne illnesses, and growth in demand for packaged and convenience foods. The shelf-life testing market, by food tested, has been segmented into packaged food, beverages, bakery & confectionery products, meat & meat products, dairy, dairy products, and desserts, processed fruits & vegetables, and others. The packaged food segment is estimated to dominate the market in 2018 and is projected to grow at the highest CAGR by 2023. Rapid urbanization has led to changes in consumer lifestyles. Higher employment opportunities and higher disposable incomes have led to an increased consumption of packaged food products. The contamination of most packaged foods occurs from the processing machinery or product formulations, which could then lead to faulty shelf-life claims. In order to avoid such instances, product manufacturers are increasingly conducting shelf-life tests to provide consumers with proper product information. The shelf-life testing market, by technology, has been segmented into equipment- & kit-based and manual tests. It was dominated by the equipment- & kit-based segment in 2018. More reliable results and quick turnaround time drive this segment, which consists of both traditional and rapid systems and is highly preferred by manufacturers. Europe dominated the shelf-life testing market in 2017 as it has the highest number of testing laboratories with a high number of samples tested in the world. Further, the region has the most stringent regulations that also undergo frequent updates. As a result of strict regulatory enforcement throughout the stages in the food supply chain, the highest number of sample tests are conducted in Europe for both safety as well as quality purposes. The Asia Pacific market is projected to grow at the highest CAGR from 2018 to 2023. Growth in the Asia Pacific region can be attributed to factors such as growth in the number of shelf-life testing laboratories in India and China, the rise in the number of incidences of bacterial infectious diseases in the region, and growing adoption of convenience and packaged food in the region. The lack of market coordination & standardization and improper enforcement of regulatory laws & supporting infrastructure in developing economies restrain the market growth for shelf-life testing. The global market for shelf-life testing is dominated by large-scale players such as SGS (Switzerland), Bureau Veritas (France), Intertek (UK), Eurofins (Luxembourg), and ALS Limited (Australia). TÜV SÜD (Germany), TÜV NORD GROUP (Germany), Mérieux (US), AsureQuality (New Zealand), RJ Hill Laboratories (New Zealand), SCS Global (US), Agrifood Technology (Australia), Symbio Laboratories (Australia), Microchem Lab Services (Pty) Ltd (South Africa), and Premier Analytical Services (UK) are other players that hold a significant share of the shelf-life testing market. The focus on reducing lead time, sample utilization, cost of testing, and drawbacks associated with several technologies have resulted in technological innovations and the development of new technologies in the spectrometry segment. Greater adoption of these technologies, with financial support from government authorities, is an opportunity for medium- and small-scale laboratories to expand their service offerings and compete with large market players in the industry, as these technologies offer higher sensitivity, accuracy in results, reliability, multi-contaminant and non-targeted screening with a low turnaround time, and cost-effectiveness, among other benefits. Instruments and related consumables of high-end technologies such as chromatography and spectrometry used for effective shelf-life testing of food samples are associated with high costs. Furthermore, an increased focus on R&D activities, coupled with the necessity for accuracy and reliability of readings, is increasing the price of these instruments. Since most of these testing instruments are exported in large quantities from developed countries in North America and Europe, it adds to the cost of procuring these technologies, especially in developing economies. The growing number of national standards for food shelf-life management has led to ambiguity, and there is a need for harmonization of these shelf-life standards. Leading industries in the food sector have increasingly recognized the cost and inefficiencies resulting from the development of multiple shelf-life standards. Neither ingredient suppliers nor retailers or food manufacturing companies are well served when duplicative standards and audits raise total costs for shelf-life certifications without enhancing or ensuring the overall safety of food. Eurofins signed an agreement with LabCorp to acquire its food testing and consulting business, i.e., Covance Food Solutions for USD 670 million. This is expected to help Eurofins expand its presence in North America, the UK, and Asia since Covance Food Solutions operates an integrated network of 12 facilities across the globe with 9 in the US, 2 in the UK, and 1 in Asia. SGS acquired Vanguard Sciences Inc. (US) which is a provider of microbiological, chemical, and physical testing of food products. This is expected to help the company in expanding their existing testing capabilities in the US. Eurofins set up a new 3,900 square meter food testing laboratory in Suzhou (China). This new laboratory highlights the company’s commitment to serving its clients in Asia Pacific with world-class testing services. This project represents a total investment close to USD 3.3 million. SGS expanded its presence in Russia by opening a new food testing laboratory in Moscow, Russia. The laboratory provides testing services for detection and assessment of heavy metals, mycotoxins, histamines, polychlorinated biphenyl (PCB), radionuclides, preservatives, pesticides, and nitrates. Mérieux signed a strategic partnership agreement with FOSS (Denmark), a manufacturer of analytical instruments for the food and agricultural sector. This agreement helped the company to enhance its analytical services. Mérieux signed an agreement to form a global food safety partnership with Danone (France).